The British have long enjoyed food with a bit of bite. And 200 years ago, an Indian migrant opened Britain's first curry house to cater for the fashion for spicy food. unequalled to any curries ever made in England." So ran the 1809 newspaper advert for a new eating establishment in an upmarket London square popular with colonial returnees. Diners at the Hindostanee Coffee House could smoke hookah pipes and recline on bamboo-cane sofas as they tucked into spicy meat and vegetable dishes. This was the country's first dedicated Indian restaurant, opened by an entrepreneurial migrant by the name of Dean Mahomed. But Britons already had a taste for curry. A handful of coffee houses served curries alongside their usual fare, and in the gracious homes of returnees, ladies attempted to recreate dishes and condiments their families enjoyed on the sub-continent. Some wrote out their own recipes; others may have used one of the many editions of Hannah Glasse's The Art of Cookery, first published in 1747, which contained recipes for curries and pilaus. "The first recipes were very mild, using more herbs than spices," says antiquarian bookseller Janet Clarke, who specialises in gastronomic titles. "These were curries and pilaus made with coriander seeds, salt, peppercorns and lemon juice." By the 19th Century, ginger, cayenne, turmeric, cumin and fenugreek had been added to the mix. "I have tried making these old recipes myself - they are wonderful." Piccalilli is an early English attempt at Indian pickle; kedgeree's origins are more ambiguous, but this colonial-era dish uses Indian spices. Food historian Ivan Day says cooking methods also differed. 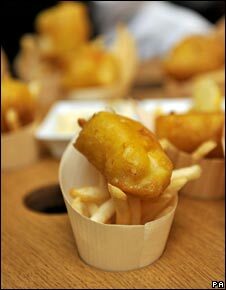 "The British didn't really get the idea of frying the meat in ghee or another fat. Rather than the fresh spices available in India, these had been on a boat for half a year." 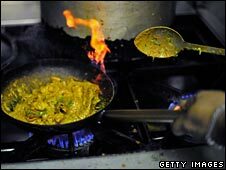 Peter Groves, co-founder of National Curry Week, which started on Sunday, says the Western taste for spicy foods developed centuries earlier. "All the spices of the East came back with the people who fought in the Crusades." The lucrative spice trade prompted various European powers to establish their presence in India, either through trading companies or colonisation. This "masala" of cultures, and the Mughal conquest of India, resulted in hybrid creations, including Persian-inspired biryani and vindaloo, a Goan version of a Portuguese meat dish. Indians tend to label dishes by specific names like korma and dopiaza. "Curry is a catch-all term," says Dr Lizzie Collingham, author of Curry: A Tale of Cooks and Conquerors. "It's easy shorthand for 'what Indians eat'." "All hot food of the time was referred to as cury. It came from the French word 'cuire' which means to cook." A 19th Century account records the British in India eating curry for breakfast, lunch and dinner. 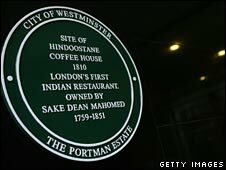 Yet within three years of opening the Hindostanee in London, its proprietor, Mr Mahomed, applied for bankruptcy. "It was a good restaurant but the climate was wrong," says Mr Groves. "People didn't go out to eat then. They tended to have their own chef or do cooking at home." The restaurant carried on until 1833, but under different ownership. The British enthusiasm for all things Indian spread to the expanding middle classes over the 19th Century. "Queen Victoria made it very fashionable, as she had an Indian staff who cooked Indian food every day," says Mr Day. At Osborne House, Victoria - the Empress of India - built an Indian-themed state room decorated by an eminent architect of the Punjab. "Give Miss Sharp some curry, my dear," said Mr Sedley, laughing. "Do you find it as good as everything else from India?" said Mr. Sedley. "Oh, excellent!" said Rebecca, who was suffering tortures with the cayenne pepper. "Try a chili with it, Miss Sharp," said Joseph, really interested. "A chili," said Rebecca, gasping. "Oh yes!" She thought a chili was something cool, as its name imported, and was served with some. "How fresh and green they look," she said, and put one into her mouth. Curry became so popular, an 1852 cookbook stated "few dinners are thought complete unless one is on the table". Novelist William Thackeray - who was born in Calcutta - penned a Poem to Curry, and inflicted a blisteringly hot curry on his anti-heroine Becky Sharp in Vanity Fair. But the interest in curry cooled after 1857 when Indian soldiers rebelled against British rule in the subcontinent. "[Curry's popularity] recovered by the 1870s when Prime Minister Disraeli decided to make empire a part of his politics," says Dr Collingham. India became the brightest jewel in the crown, but Mr Groves says British culinary interests were turning from East to West. "Everyone who was anybody had French chefs." "At the beginning of the 20th Century, curry was not very popular," says Dr Collingham. "It was not well-to-do to have a house that smells of curry." 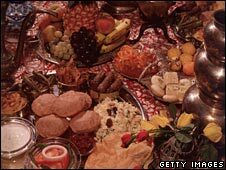 Instead, the British diet was dominated by red meat, accompanied by home-grown vegetables such as cabbage and potatoes. At the same time, a number of Indian sailors jumped ship or were dumped at major ports including Cardiff and London. These seamen from Sylhet - now a region in Bangladesh - opened cafes, mainly to cater for fellow Asians. "They were self-taught but they cleverly adapted themselves to the British palate," says Mr Groves. And in the 1940s, they bought bombed-out chippies and cafes, says Ms Collingham, selling curry and rice alongside fish, pies and chips. "They stayed open really late to make money to catch the after-pub trade." And so the ritual of the post-pub curry was born. "It took quite a long time for the British to recover from World War II," says Ms Collingham. "They were willing and more open to try new things." 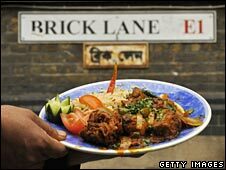 After 1971, there was an influx of Bangladeshis following war in their homeland, particularly to London's rundown East End. Many entered the catering trade, and today they dominate the curry industry. "They own 65-75% of the Indian restaurants in the country. Without their input and hard work, we wouldn't have the curry industry that we have today," says Mr Groves. An industry so popular the then foreign secretary Robin Cook described chicken tikka masala as "a true British national dish" - and yet another example of an Indian recipe modified for British tastes. Ms Collingham says ultimately, the British love affair with curry boils down to the imagined glamour of the Raj. "India has a certain magic because of the colonial relationship." In 1945 my mother took on the post of live-in cook to a family who were recently returned from India. He was a colonel in the Indian Army and they asked my mother to prepare curries. At that time spices were hard to come by, especially in rural Somerset. The only ingredient obtainable was packaged curry powder. However, with a few sultanas and apple, they accepted her efforts, but they must have noticed the difference. I have visited India twice and know the real thing. When my parents came over from E Africa in the late 60s we used to go by bus to west London to do our Indian shopping. My mum used to make curried everything. We used to have curried omelettes with curried beans for breakfast, curried stuffed sandwiches and a full meal at home in the evening with a veg dish, a meat dish, yogurt and chapattis. Our neighbours used to love the smell from about 6pm as my mum would prepare the meal and our neighbour used to come over every other week for a meal. Happy days. My father used to prepare a curry from a recipe he claimed he was given by some Indian troops in Borneo. I always assumed it was his own invention because I had never encountered a curry similar anywhere else. Fifteen years after he died, I tried a curry from a takeaway that I had not had before. The moment I tasted it, I burst into tears. It was identical to the one my father used to cook. I had a flash of a vision of him standing by the cooker in our old kitchen. I ate it with tears streaming down my face. It's worth pointing out that the chilli comes from South America, not Asia, and didn't reach India until the 1600s when the Portuguese went there (inventing vindaloo at the same time). Before that Indian food was spiced with pepper and mustard seed so these "old" recipes for milder curries may be more authentic than we think. Dean Mahomed was certainly an interesting chap. He also became so-called shampooing surgeon to George IV. My dad introduced me to curry 40 years ago. He worked in a factory with an Indian man who used to bring a curry to work for his lunch. My dad was always adventurous with food and he got the recipe off him and my mum cooked it for the family. And since then I have been an addict. I eat, and cook, curry because I love it, not because of some love of the Raj. My ex-husband and his brothers always liked a really hot curry - they would even ask their local curry house to "spice it up a bit". I recall once getting some of his home-made curry sauce on the back of my hand, and it burned even there. I dread to think what would have happened to my intestines if I'd eaten it. Our cat, Rumpole, could happily eat the leftovers without suffering any apparent ill effects. Curries have opened up the English palate (and pores) for many decades, and the combination of savoury and sweet (such as chutneys) is usually a good one. Look at the worldwide success of Patak's sauces and condiments - we even get them over here. Having grown up in an Indian household, I have always been fed curry - but not the rich, creamy, exotic sort you get at restaurants, but the simple, homemade type, for example, simple lentil soup (daal). Somehow, the simple homemade type always beats the restaraunts. You should try it. Perhaps not well known however the masala sauce often served in Indian restaurants the length and breadth of the UK was actually invented by an Indian chef in Glasgow some 20 years ago as customers found some dishes too dry. Despite curry's post-1857 decline in popularity amongst the military, today you will often be invited to events that include a "curry lunch" by the Army. I developed my love of Indian food whilst at Huddersfield poly in the early 70s. The food in the Indian (Punjabi) cafes there was delightful. On moving to Newcastle I was pleased to see that there was a significant Punjabi population in the West End of the city. So my supplies of spices etc could be replenished. It took me a few years to be able to cook Indian food that didn't taste medicinal. I have a large number of Indian cookbooks, but always return to the old faithfuls Madhur Jaffrey and Khalid Aziz. I've been told by an Indian cook that the English derived the word "curry" from the Tamil word "kari" meaning sauce. In Tamil karivepilla are curry leaves, a leaf often used as a garnish. In Hindi "kaalee" (pepper) may also have been misheard by the English as curry, establishing the link with hot foods. I was told by my father that the word curry derived from curdi, a yoghurt based spicy soup originating in the Gujurat, Western India. 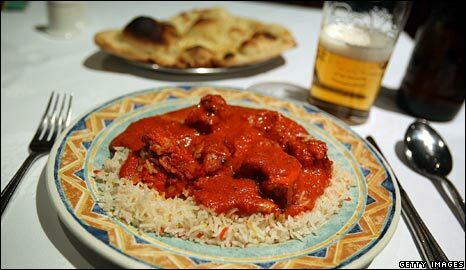 The best thing to happen to Glasgow, you can't beat a freshly cooked curry, and the pride they take in cooking it. Everywhere you go in Glasgow you find a restaurant or takeaway - you always come across a little gem in the smaller restaurants. I live very close to Brick Lane and never tire of the wonderful smells as I walk to the tube. The Bangladeshi supermarkets are quite spectacular with their range of spices, lentils, pulses, vegetables... I consider myself very lucky to live here. "Ms Collingham says ultimately, the British love affair with curry boils down to the imagined glamour of the Raj." Absolute tosh. It's popular as curry has many different tastes and are a change for the palate. After nine pints of strong lager, I would imagine most late night curry house clients are not motivated by a wistful longing for the glamour of the Raj. We eat curry because we like it, not because of some ideal image of India. Believe me, I don't eat burgers imagining myself in Disney World, nor do I eat Chinese and think up wonderful women in tight dresses. I'm a British student in Chicago, and I live close to the main Indian/Pakistani neighbourhood, so there is no shortage of curry houses. But the food is so different from British curries, and I miss the familiar tastes. After having lived in Leeds, Liverpool and Warrington, I acquired a love of Indian food. My country left the Empire over 200 years ago before India became the jewel in the crown. Indian restaurants were scarce outside of large major metropolitan areas. Now I live on a US Caribbean island, bought from the Danes, without the colonial legacy of Britain which means: there is no Indian food. There are no Indian restaurants. There is no naan bread! Veeraswamy's of Regent Street claims to be the oldest Indian Restaurant in the UK. You are mean. I really want an Indian takeaway now. Yummy curry with a huge bit of naan bread. Mmmmmm... but all I have is beans on toast for lunch. Shocking.